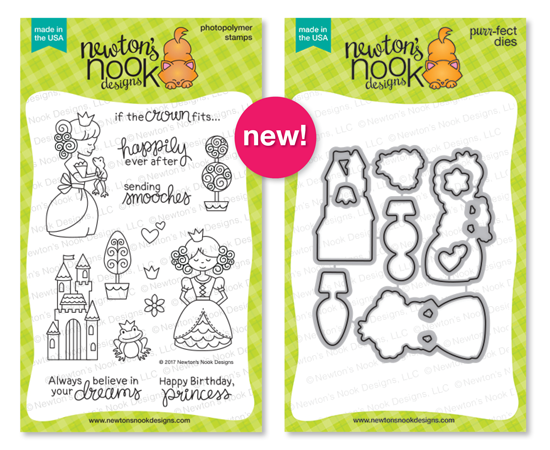 Welcome to the last day of the September release from Newton’s Nook Designs. I know you have been waiting for it so here it is…NEWTON! In costumes! Oh my goodness, this set could not be even a little cuter! Seriously…if you love Halloween, you will just fall in love with this set. An adorable Newton with costumes of all kinds. The hardest part for today’s post was choosing which one to start with! I thought that the little bee was hilarious (and I always think little kids dressed like bees are too sweet for words). 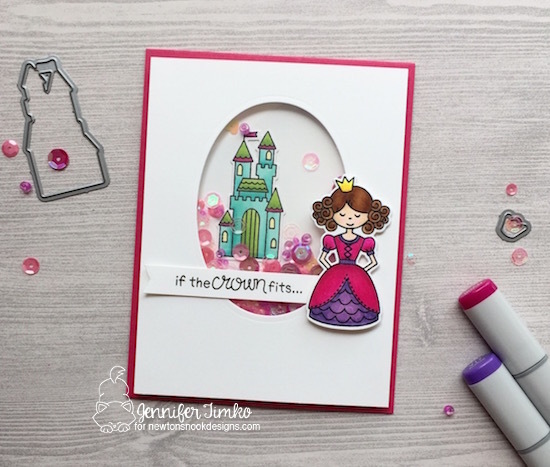 Jen and Jeff have made this set perfect for quick cards too. 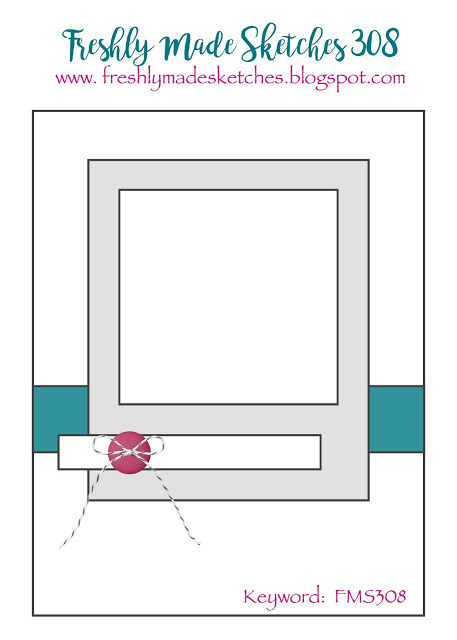 All you have to do is stamp and cut out the images. 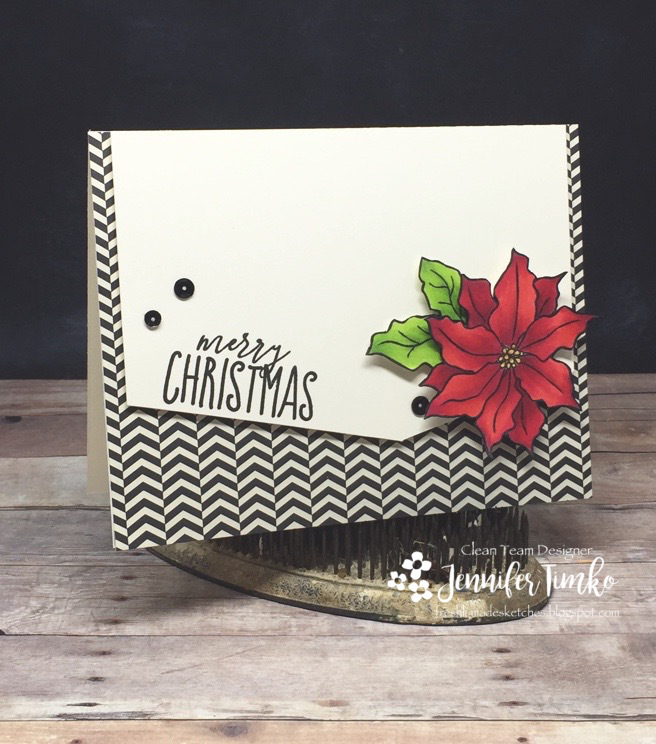 Easy layering for fast and fun cards! I did just that. 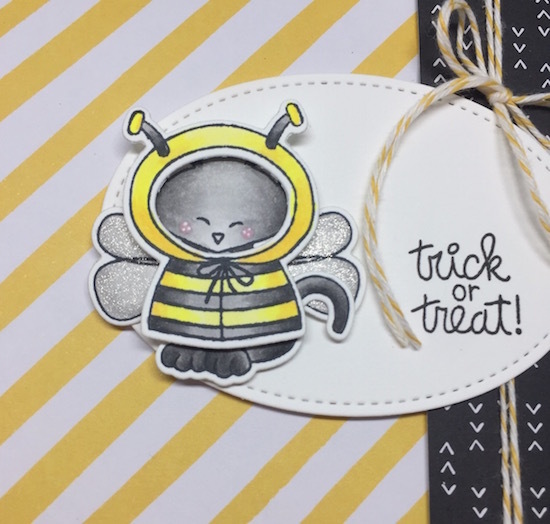 I stamped the bee suit and the wings, plus the kitty and cut them out with the matching dies. I did some quick Copic coloring and then dug through my stash of patterned papers to find some that matched. I thought this yellow striped paper was perfect behind my little kitty bee. Oh, and take a closer look a the coloring. I added a little bit of Wink of Stella to the wings. Because every bee needs shimmery wings, don’t you think? Now I get to play with the rest of the costumes. You are sure to want to do the same! And now for the part you always love!! 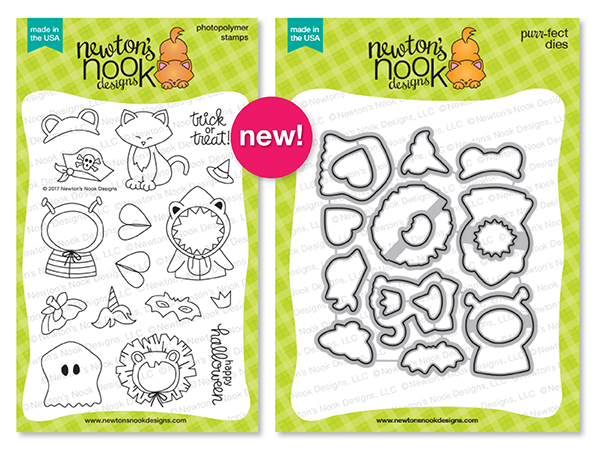 Would you like to win the “Newton’s Costume Party” Stamp Set? Thanks for stopping in today and during this whole week. Your comments always make me so happy and your enthusiasm for NND is contagious! All of this week’s release will be available tomorrow! 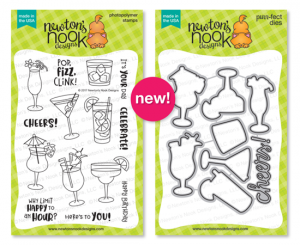 This week Newton’s Nook Designs and Chibitronics are partnering for a fabulous inspiration week! All week long both design teams will be sharing ways to light up your cards using Chibi lights with Newton’s Nook Designs stamps! This is a match just made to work together since so many of the NND sets have features that are perfect for lighting up. As soon as I heard about the collaboration, my first thought was this dragon from Knight’s Quest. I just knew that somehow he had to have “real” fire! I started by coloring the images with Copic Markers (I have colors listed in my YouTube video). I cut the hills using the Land Borders Dies (NND) and stitched rectangles dies (SSS). 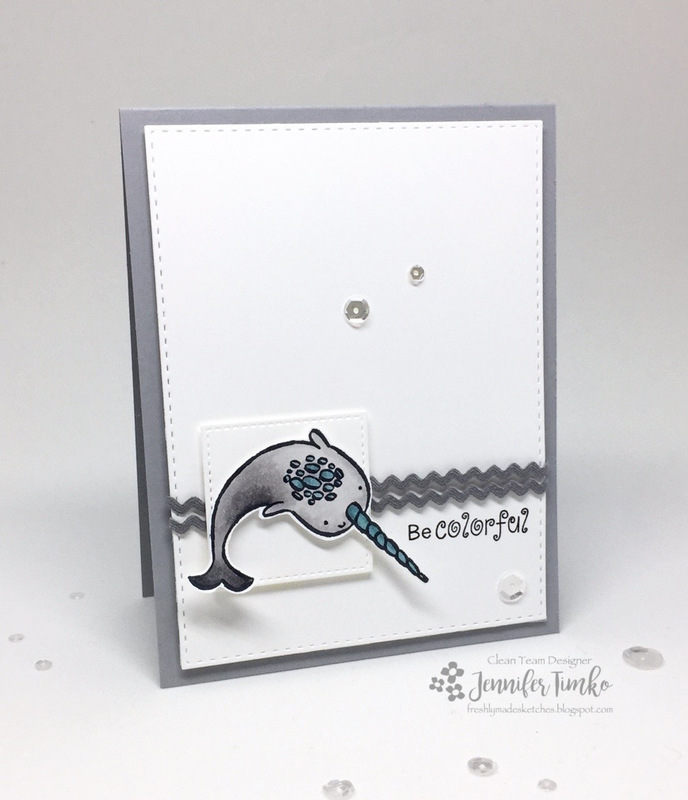 My base is the new Tranquil Tide card stock (a Stampin’ Up In Color) that is sponged with Night of Navy ink. The hills are Night of Navy and Smoky Slate (SU). 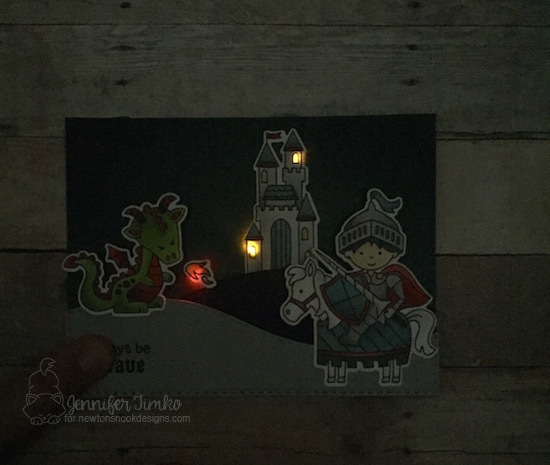 I put one of the red lights behind the fire and yellow lights behind the windows to create this awesome interactive card. Want to see it lit?! I’m so glad you stopped in today! I hope you enjoy this amazing week of fun! This is my first post for today (my second, for the August release from NND will be up shortly following). After an amazing week of inspiration and celebration from Freshly Made Sketches, we are on our way to the next 300 sketches this week. The sketch hostess is our lovely friend Jen Brum and she has a unique angled sketch for us this week. I’m in love!! I chose to make another Christmas card since I’m starting to get the holiday card making buzz. 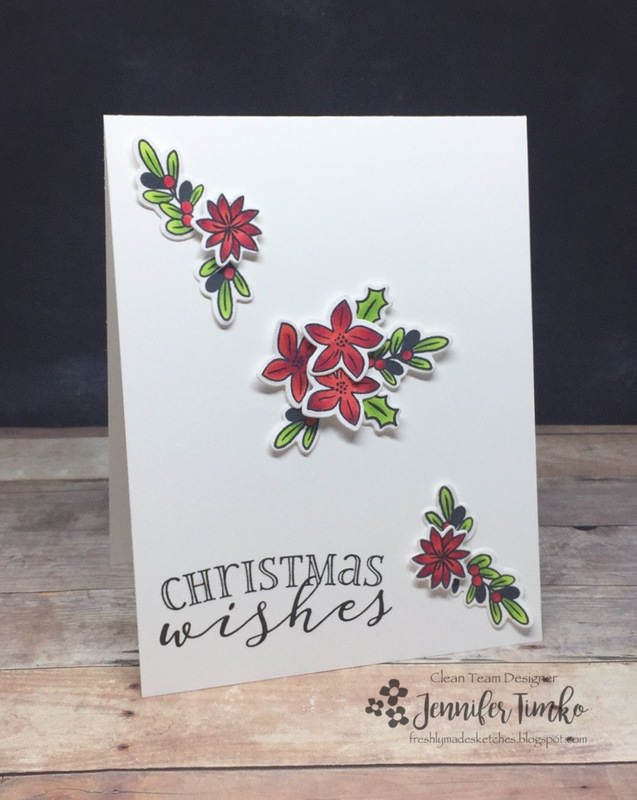 What better image than this beautiful flower from the Poinsettia stamp by Simon Says Stamp? I’m taking another Copic coloring class this Friday (YAY!!!) and I thought I should probably put in a little practice before going. So out came my reds and off to coloring I went. I added in some leaves from the set for another pop of color and then made the rest using Vanilla and Black. Yes, Vanilla. 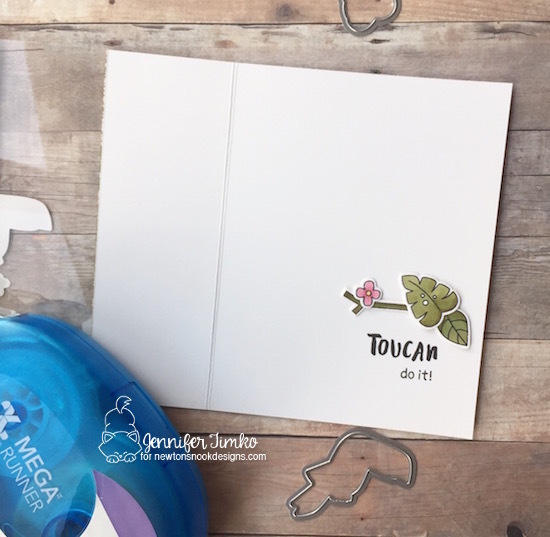 Because Stampin’ Up has a new Thick Vanilla card stock that is amazing!!!! And it works beautifully for Copic coloring!! I chose this sentiment from Concord and 9th since I thought it was a nice fit on the angle and then added some sequins in black. This patterned paper is retired from Stampin’ Up (I have huge stash of black and vanilla papers that I think will finally get the love they deserve!). I hope you have a great time with this sketch! The team has provided their always spectacular inspiration so check out their work! Thanks so much for stopping in. So glad to see you! Coffee Makes You Sharper! published on August 8, 2017 Read more posts by the author of Coffee Makes You Sharper!, Jentimko1 Comment on Coffee Makes You Sharper! 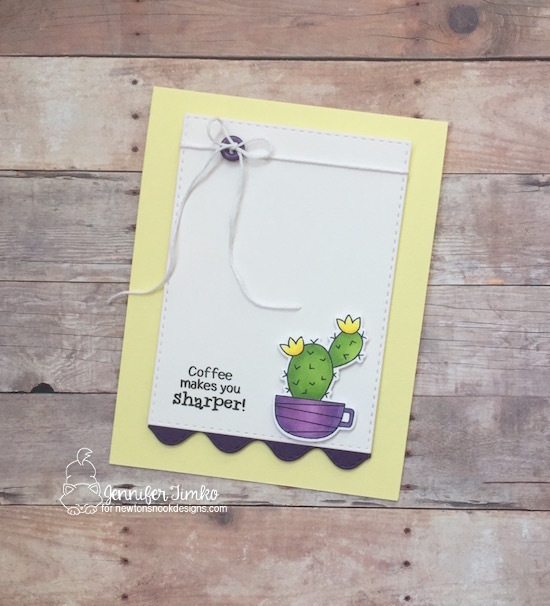 Today is my day to share a project on the Newton’s Nook Designs Blog and I wanted to share a fun card with this adorable Cuppa Cactus set. It is such a fun set for coloring and I love this sentiment! I tried a new color combination for today and I really like this pale yellow with the purple. I chose the purple for coloring the cup and then mimicked it with the Sea Borders Dies to add a little scallop edge on the bottom of the image panel. I think it adds an interesting pop of color but it is super easy to create. I pulled out a button, which somehow seemed to be just the right touch for the twine. Now I know this is a pretty clean card but I wanted just to spend a few minutes on the coloring. Seems like time is at a premium but the coloring was just what I needed for a little “mom break”. Only one more week until school is ready to start and then I’ll have lots more time for more complicated cards. Until then, less layers, pretty colors…yep, totally a summer vibe. I can’t wait until tomorrow. Make sure you come back tomorrow to see what we have up for you to celebrate Freshly Made Sketches 300th Sketch Challenge. Until then, have a great day! Welcome back for a special post today. I’m so excited to share that Newton’s Nook Designs and Xyron have partnered for an amazing inspiration week. Each day this week there are fresh ideas using Newton’s Nook Designs stamps and Xyron adhesives on both the NND blog and the Xyron Facebook page. As I thought about how to best show you both the stamps and the adhesive, I realized that a window card would be perfect for both! 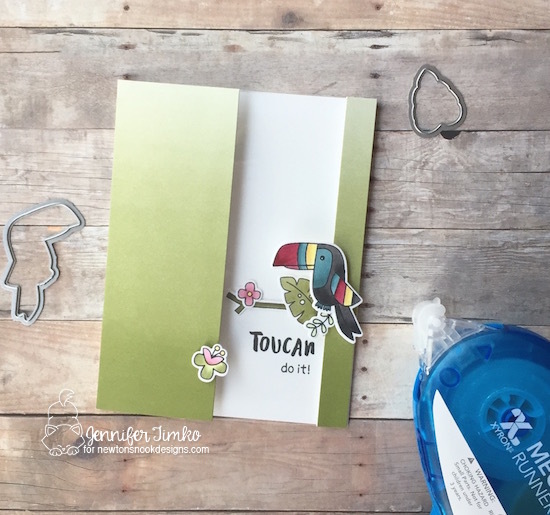 I chose the Toucan Party stamp set (it really is fun, don’t you think?!) and created this fun window that depends on the strength of a good permanent adhesive. 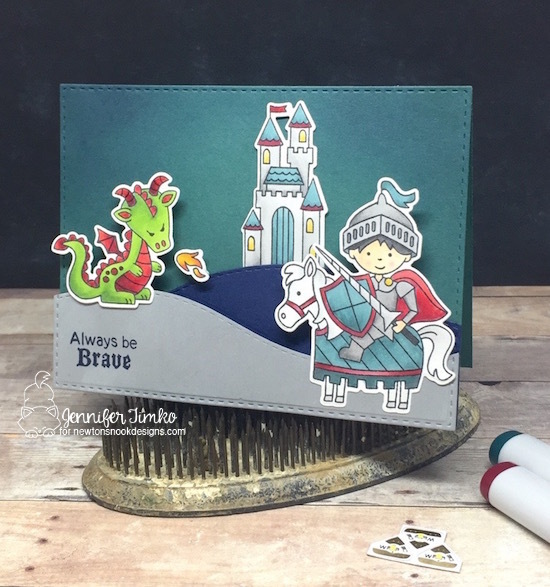 I colored the images using Copic markers to coordinate with this Color Theory DSP from Stampin’ Up. Want to see the inside? Because it is easier to explain “in person”, I created a video to show you how I colored the images and created the card. Hello friends!! Sorry about the long break. Pesky work and fun summer activities have gotten in the way over the last couple of weeks and I haven’t had any real time in the stamp room. GASP!!! 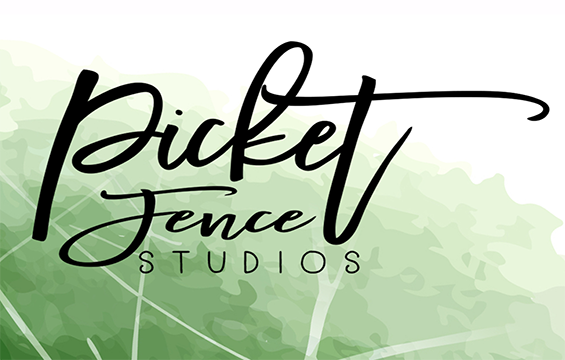 So what to do when presented with a great sketch over at Freshly Made Sketches? When it is a million degrees outside in July? Create the first Christmas card of the year, of course! I love this sketch by the witty and fabulous Linda Callahan. As soon as I saw this one, I started pondering a meandering group of images on the diagonal. Somehow, these pretty little leaves and flowers practically jumped out of the stamp collection and a Christmas card was born. I stamped the images from WPlus9’s Be Merry in Momento Tuxedo Black and colored with Copic Markers using traditional colors. Something about the pops of red and green against the white base really made me happy. I confess that the sentiments in this stamp set are what drew me in and I LOVE this one. Well, I’m back to my previously scheduled chaos. On the agenda today….back to school clothes shopping. For a rising high schooler and a rising middle schooler. Pray for me. *smile* Make sure you check out the inspiration from the team and I can’t wait to see how you interpret this sketch! Have a great day! 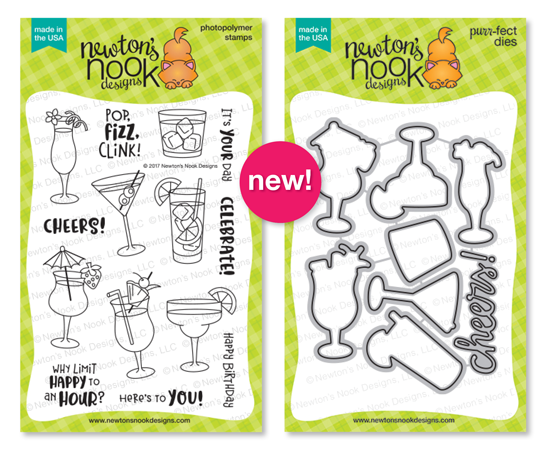 Are you ready for another day of celebration with Newton’s Nook Designs? Yesterday was quite the reveal, don’t you think?! Well, today you get to see two more stamp sets! It keeps getting better! The first stamp I am going to show you is called Stowaway Newton. Now I don’t know about you, but I know a certain cat (a calico who shall remain nameless, haha) who likes to pack herself in my bag. And when I come home from trips, if I keep the bag closed she simply sleeps on top of it. So when I saw this set, I fell in love. I created the luggage I wish I could carry around airports by coloring with Copic Markers. Behind the image, I used the new Pawprints Stencil and some Distress Ink. 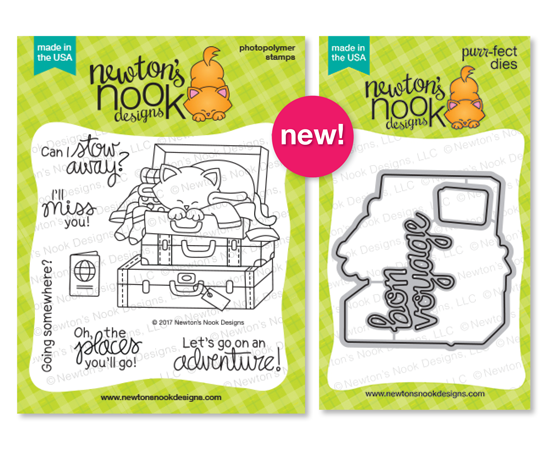 This stencil is going to become a go-to with all my Newton stamps! The sweet little sentiments in the set are fabulous and I stamped this one with Versafine Onyx Black. I added a little bit of washi tape along the edge to finish this bright, happy card. 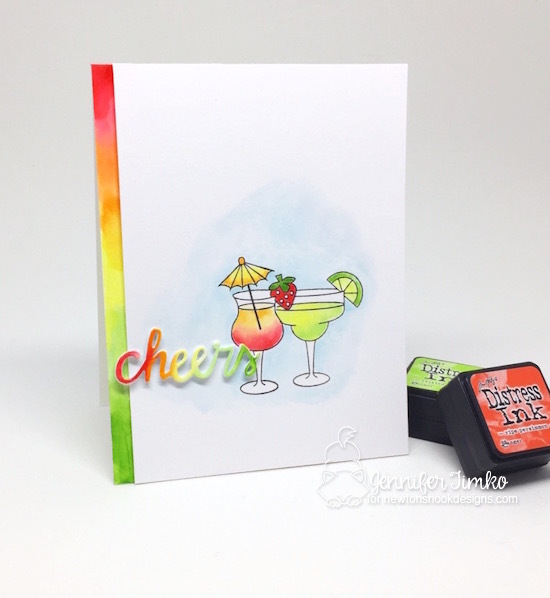 Apparently bright and happy was on my mind for today’s release cards because I chose a similar palette for this great set called Cocktail Mixer. I played around with my Distress Inks to created this pair of tropical drinks. Don’t they look tasty?! And what better sentiment than the one from the coordinating die set! I cut the sentiment from Bristol Smooth paper and then colored it using the same inks as the drinks. Kind of a tropical rainbow! Then I did the same rainbow effect for the side border. This is such an easy technique but it creates such a wow effect. I am so happy that you stopped in today. Tomorrow will be Day 3 of this great celebration and I also have a sketch from Freshly Made Sketches where I’ll be the sketch hostess. See you then! 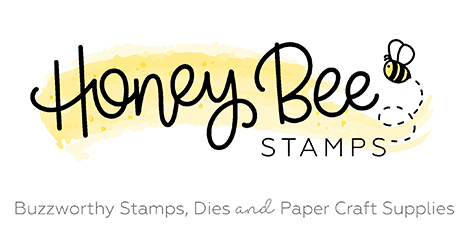 So remember in my post last Friday (for Fancy Friday) where I talked about some of my favorite things from the new Stampin’ Up catalog?? Well, yesterday I showed you a bit of why I love the Color Theory paper and today I’ve got the narwhal!! I love him!! The incredibly talented Narelle Farrugia is our sketch hostess this week at Freshly Made Sketches and I thought her sketch this week gave me the perfect chance to show you this fellow. He comes from the stamp set called Quirky Critters and actually has a sentiment attached to him. I could not seem to make the sentiment work for the sketch but I really wanted to use him. So….I just cut him out by hand and added another sentiment from Newton’s Nook instead (Beautiful Plumage). I think this one is super fun and perfect for this guy. I stamped the narwhal using Momento Tuxedo Black ink and colored him with Copic Markers. He seemed to fit better on a little square than a circle so I hope Narelle doesn’t mind the switch. For the horizontal element I tried something new. A few weeks ago, my mom was here to visit. 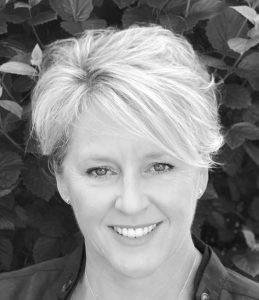 She is an amazing quilter and believes in supporting local quilt shops wherever she travels. Hmmm….that may explain where I get that from! As we were looking around (and the shop here in Warrenton is called Kelly Ann’s Quilting…a gorgeous shop! ), I was falling in love with all the prints and patterns, wishing they were all paper. Then I spied this tiny rickrack trim (in multiple colors no less!). Needless to say, I grabbed it right up. Isn’t it fun??? Ok, well, I’m completely off track for my post but seriously, shops like that are so inspirational! Since this rickrack matched the narwhal perfectly, it was clearly meant to be. I match the bling elements of the sketch, I added some Sparkling Clear sequins from Pretty Pink Posh. They are clear but have a bit of gray tint to them so I love them on cards with gray. Well, I hope you love this little guy as much as I do. Not sure why, but he really does crack me up. I showed the card to my husband and he said it was just like the narwhal from the movie Elf. So on that note….”Bye Buddy”! Thanks for stopping in today! Hope your week is great!